Born in 1882, Albert (Adalbert) G. Bela was a Slovakian national who emigrated to the United States sometime prior to the turn of the Century. It's more than likely that his first name was actually Adalbert, the Slovakian version of Albert. Little is known about the man prior to 1905 when he was amongst the organizers of the Pettingell Machine Co. The Pettingell Machine Co. was named after its founder, Charles Franklin Pettingell, who established an Amesbury, Massachusetts machine shop in the early 1870s that specialized in the manufacture of carriage and wheel-building apparatus. Charles Franklin Pettingell was born on February 12, 1847 at Salisbury, Massachusetts (now Amesbury) to Amos (b. Jun 15, 1817-d. Mar. 27, 1883) and Mary (Lawton) Pettingell, a local contractor and builder. At the time Amesbury was one of the top three carriage-building centers in the United States, the others being Cincinnati, Ohio and New York City. Between 1870 and 1890, the industry transitioned from producing completely hand-made vehicles built to order to mass-produced conveyances whose components (wheels, carriage gear, dashes, etc.) were built in large factories by mostly unskilled labor using machines tools supplied by Pettingell and others. By 1873 Pettingell had established his own machine shop and business must have been good as he married S. Ellen Bartlett, the 20-year-old daughter of W.H. and Louise Bartlett on December 16, 1874. Pettingell licensed wheel-making equipment from local carriage-makers such as Joseph Richardson Locke of Locke & Jewell (manufacturers of the Warner patent wheel) in addition to devising his own time-saving appliances. (Although Locke's patents were not specifically assigned, he apparently licensed his designs to Pettingell as the machines are nearly identical.) Pettingell was soon advertising the Locke-based C.F. Pettingell Rim and Felloe Rounding Machine to the carriage industry in the popular carriage trades. "The wheel factory of Locke & Jewell at Patten's Hollow was established in 1867 and is doing a large business in manufacturing wheels and carriage parts, and have recently added to their other branches the manufacture of carriages. The whole amount of business for 1880 was $100,000, and the number of workmen employed was fifty-two. During the year they have manufactured six hundred carriages." "Patent rim planing machine. Hub mortising-machine, with cutter or cones. Polishing-machine for polishing spokes. Polishing-machine for polishing carriage-parts. Polishing-machine, for polishing rims. Rim-rounder. Rim boring-machine. Round tenoning-machine. Spoke tenoning-machine. Lathes, with or without centering-machine. Spoke smutting-machine, or re-tenoner. Spoke facing-machine. Surface-planer for rims. Polishing-machine, for carriage-woodwork. Surface-planer for rims. Polishing-machine, for carriage woodwork. Power mortising-machine. Foot-power mortising-machine. Surface planers. Dressing-machines. Rabbeting-machines. Saw tenoning-machines. Rounding-machines. Boring-machines." In 1887, one year before Amesbury's legendary "Carriage Hill Fire" of Maundy Thursday - April 5, 1888 - a much smaller blaze heavily damaged C. F. Pettingell's machine shop and the adjoining Locke & Jewell carriage and wheel works which were located on Mechanics Row. Both firms rebuilt and remained in business throughout 1888 when most of their competition was busy rebuilding. Although Pettingell was spared in the famous 1888 blaze, a much smaller blaze that occurred on October 10, 1891 severely damaged both Locke & Jewell's and the adjacent Pettingell manufactories which were both located on Mechanics Row, adjacent to Patten's Pond. "In Amesbury Mass., the carriage manufactory of Locke & Jewell and several surrounding buildings, were burned yesterday. Loss $125,000." Both firms rebuilt but by 1897 only Pettingell remained in business, Locke & Jewell had retired and sold off their assets to their neighbor. "ORDERS COMING IN: Business is Looking Up In Amesbury and Merrimac. "AMESBURY, Aug 20 — The settlement of the tariff question has caused business here to boom. Today the Pettingell Machine Works, one of the best known concerns in the country, started up after a two months' shut-down." Existing advertisements reveal that by that time Pettingell offered approximately thirty different labor-saving machines for the carriage-building industry. Products included tenoners, tilting arbor bevel saws (table saws) and irregular template dressers for wooden working plus friction cutters and rolling formers for sheet metal fabrication and their ever-popular rim and Felloe rounding machines. The Twentieth Century brought a steady decline in Pettingell's wheel and woodworking machine business. In mid-1905 a group of Amesbury businessmen and Pettingell employees headed by Albert G. Bela (the subject of this write-up) purchased the failing business from Pettingell for pennies on the dollar, reorganizing it on November 14, 1905 as the Pettingell Machine Co.
Bela and his backers felt the firm's machine shops could be re-purposed to turn out the new metal-finishing machines needed by Amesbury's burgeoning automobile body builders and set about designing new machines that greatly reduced the amount of time needed to turn out a metal-skinned composite automobile body. Their most successful invention was the Pettingell Automatic Hammer which was thoroughly tested at Amesbury's numerous auto body factories before being marketed to the nation's composite automobile body manufacturers. US Patent Office assignments reveal that some of Pettingell’s metal-working machines were designed by Amesbury resident George L. Knights, a former bicycle manufacturer. The firm's numerous metal working machines were the perfect companions to their woodworking offerings, and new composite body-building enterprises often ordered the bulk of their equipment straight out of the Pettingell catalog (highlights of which are presented in the left margin). The Pettingell Machine Co. was dissolved in 1915 (according to the General Court of Mass. proceedings 1917 edition.) and reorganized. Although he had stayed on as a junior partner in the firm bearing his name, Charles I. Pettingell, Charles Franklin Pettingell’s son, left the firm and went to work for the Walker-Wells Body Co., one of Amesbury’s large production body builders. Concurrent with the 1915 bankruptcy of the Pettengell Machine Co. its former president, Albert G. Bela, began supplying bodies in the white for the Winton Motor Carriage Co of Cleveland, Ohio. When completed the bodies were transported across town to Biddle & Smart where they were finished, painted, and trimmed after which they were transported via rail to Winton's Cleveland assembly plants. Production bodies soon followed for Winton's neighbor, the White Motor Co., and Syracuse, New York's Franklin Automobile Company. Bela also built small numbers of full-custom bodies for Boston's automobile dealers. Bela-bodied Liberty, Lenox and National chassis were displayed at Mechanics Hall during the 1917 Boston Auto Show and the firm is known to have built coachwork on Cole, Marmon, Mercer, Packard, Peerless and Simplex chassis. By mid-1916 orders were sufficient to require additional manufacturing capacity and a vacant factory in nearby Framingham was purchased from the Standard Woven Fabric Co. in order to keep up the demand. Subassemblies built in Amesbury were transported to the new Framingham plant for final assembly, painting and trimming. "The Standard Woven Fabric Co., which recently moved to Walpole, Mass., has sold its plant at Framingham and it is to be occupied by the Bela Body Co., of Amesbury, who will operate the whole property for the production of automobile bodies. The main building is of modern concrete construction, 53 by 224, three stories, having about 40,000 ft. of manufacturing space, and an attached fireproof boiler house, all equipped with sprinkler system and other modern conveniences. There is 108,720 ft. of land bordering on the railroad. Town assessment places $43,550 on the building and $7,570 on the land, making a total of $51,120." $300,000 BELA BODY COMPANY 7% Cumulative Preferred Stock (Closed Issue). Transfer Agent—Metropolitan Trust Company, Boston, Mass. Dividends Payable Quarterly, December 1st, etc. "This company builds at its plants in Amesbury and Framingham the highest grade, one piece, aluminum, custom bodies, and has placed them on many chasses, including the following: PACKARD, SIMPLEX, MARMON, MERCER, PEERLESS, COLE. Large orders have been taken from the following companies direct: FRANKLIN, WHITE, WlNTON. At the Boston Auto Show bodies built by this company may be seen on the LIBERTY, LENOX, NATIONAL. Three-fourths of the stock has been sold. Circular and Price on Application. "EARNEST E. SMITH, Inc. Specialist in New England Investments, 68 Devonshire St., Boston." "ANNOUNCEMENT!—The Bela Body Company, of Framingham, Mass. (recently organized under Massachusetts laws), have purchased one of the finest manufacturing plants in the east, and arc completely equipping it for every detail of fine Automobile Body work. "OUR EXPERTS—Our Mr. Bela, the first man in the U. S. to use an Automatic Metal Bumping Machine, is recognized as the most expert Sheet Aluminum Worker in this country. Many of the best operators owe their success to his personal instruction. Each of the men associated with Mr. Bela is a master workman—all are experts in the various departments of body building. "LEADING MANUFACTURERS in the trade are turning to us for exclusive designs and strikingly distinctive high class bodies. They realize the sales value that such bodies give to their cars, for no one denies that Bela Bodies Show "Class"
"HIGH RECOGNITION—When the leading automobile manufacturers in the country buy bodies from us—comment is unnecessary. Note the Liberty Brougham shown above. The body of this stylish Town Car or Ladies' Shopping Brougham made an instant hit. It is causing more favorable comment and selling better than any other style body for years. It is unquestionably one of the lightest, strongest and most attractive bodies ever built. Observe its compactness, its clean cut graceful lines, its handsome appearance. "ONE-PIECE CONSTRUCTION—Particular attention is called to the fact that this unique body is made entirely of Aluminum, without any seams or belt line irons (belt line rolled in). Not a seam or a joint to open or crack. The roof, sides, back—everything being without seam. This construction eliminates much weight in the belt line irons and fasteners, as it does away with these entirely. "Our Paint Department, shown opposite, is the lightest and best in the country. Our Trimming Department is a model manufacturing building. The entire building is fire-proof. LOCATION—On the main line of two railroads, within easy reach of Boston, New York, Springfield, Worcester and Providence, via state roads or railroad. When you want BODIES that will help SELL YOUR CARS—let us build them. "THE BELA BODY CO., Framingham, Mass., U. S. A." "Distinctive Bodies For Landaulets, Limousines, Sedans, Coupes, Roadsters, Touring Cars. "Limousine Body on Packard chassis. Note the pleasing effect of the special streamline cowl. "The above is one view of our Framingham factory which is used for painting, trimming and assembling of our bodies. "Our new 150 x 200 ft. building is under construction now and will be ready for use in the very near future. In this shop our bodies will be built in the white. Both buildings will be equipped with the most modern machinery and every facility for turning out the highest grade of work will be used. "We shall have our own spur track connecting with the N.Y., N.H. & H.R.R. the B.& A.R.R. where we will load our bodies direct. Our shipping facilities are the very best. "BELA BODY COMPANY, FRAMINGHAM, MASS. AMESBURY, MASS." "BELA BODY CO. Plant Enlarged. "Framingham, June 9—The Bela Body Co. has completed its new concrete building, covering 40,000 square feet of land. The company now has one of the largest factories for the production of high grade aluminum automobile bodies in New England." "Distinctive Motor Bodies For Touring Cars, Landaulets, Limousines, Town Cars, Sedans, etc. "Seven Passenger Town Car Mounted on White Chassis. "This new up-to-date factory is used for the painting and trimming of our Bela Bodies, also for the final assembling and mounting. Our new addition to this plant, 150 x 200 ft., will take care of our metal and woodworking departments, and there will be a full force of body builders in it in about three weeks. The shipping facilities are ideal, being able to load our finished work on our own track on the B. & A.R.R. and the N.Y., N.H. & H.R.R. The whole plant is designed and built to give SERVICE and QUALITY WORK. "OTTO A. LAWTON ELECTED TREASURER OF BELA BODY CO.
"Otto A. Lawton has been elected treasurer and a director of the Bela Body Company. The company has secured an additional contract to build bodies for the Franklin Company that will require the erection of a new building having about 20,000 feet floor space. The company has enough business on its books to keep the plant operating at capacity until the middle of next Spring. Mr. Lawton is a director of the H. H. Franklin Manufacturing Company, makers of the Franklin automobile." Lawton, the president and treasurer of the Franklin Motor Car Company of Boston, was originally sent to Boston in 1906 by the H.H. Franklin Mfg. Co. to serve as the factory branch's auditor. He was appointed manager of the concern in 1908, and two years later purchased a controlling interest in the firm. As owner of one of Franklin's largest distributors, Long was subsequently elected to the H.H. Franklin Mfg. Co. board of directors, a position he held into the 1930s. "Lawton, Otto A., owner, manager, Franklin Motor Car Co., Boston, Mass. ; president, Franklin Motor Car Co., Portland, Maine; treasurer, director, Bela Body Co., Framingham, Mass. ; director, Back Bay National Bank, Boston, Mass. ; director, H. H. Franklin Mfg. Co., Syracuse, N. Y." Within a year of the 1917 stock offering, Bela's board of directors accepted an offer to purchase the firm from Framingham, Massachusetts shoe manufacturer, Richard H. Long. Richard Henry Long (b. Sep. 4, 1865-d. Apr. 16, 1957) was the son of a prominent Massachusetts shoe manufacturer who took over the family business upon the death of his father, John, in 1889. Originally located in South Weymouth, Long relocated the factory to Belchertown during the early 1890s and by 1896 employed 50 hands. At the turn of the century Long moved into larger quarters in Springfield and in 1902 purchased an existing factory in South Framingham for the manufacture of his popular line of men's footwear. Located on Fountain St., halfway between Farm Pond and Waverly St. (Route 135), the wooden structure remained a local landmark until it was torn down a few decades ago. The shoe business grew and in November of 1904 Long leased a Boston factory formerly occupied by L. Prang & Co. for the manufacture of a new line of women's shoes. A second building was added to the Framingham complex in 1908 and all shoe manufacturing operations were consolidated there. During the early stages of the First World War Long supplied the British government with various canvas and leather goods used to outfit the British troops. When the United States entered the conflict Long supplied the US Army with harnesses and other leather products. His son (Richard F. Long) later stated that at the height of the War, his father's firm held $24 million worth of government supply contracts. However US Government documents reveal that although Richard F. Long (R.H. Long's eldest son) stated that the US government ordered 5 million gas mask knapsacks to congressional investigators, the actual order was for only 1 million knapsacks, and with a cost of roughly 50 cents each, that specific contract actually amounted to a little more than half a million dollars. 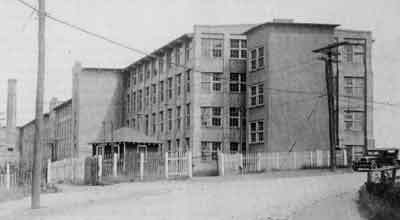 Regardless, Long clearly needed additional manufacturing capacity and in mid-1918 purchased the Framingham factory of the Bela Body Company. Auto sales had suffered a steep decline with the entry of the United States into the European conflict and A.G. Bela and his partners were anxious to unload their automotive holdings. "Ernest B. Smith & Co. announce the sale of the Bela Body Company at Framingham to Richard H. Long of Framingham. The Bela Body Company has been producing for the last two years high grade aluminum bodies for automobiles, but it is understood that the new owner will change the character of the business, idling the plant for the manufacture of war materials." Just shy of the three-month anniversary of the Bela Body Co. sale the Armistice was signed and Long's multi-million-dollar contracts were abruptly canceled. When Long purchased the business he assumed whatever contracts Bela Body was in the process of fulfilling and with the end of the War, they resumed the manufacture of Franklin body sections. 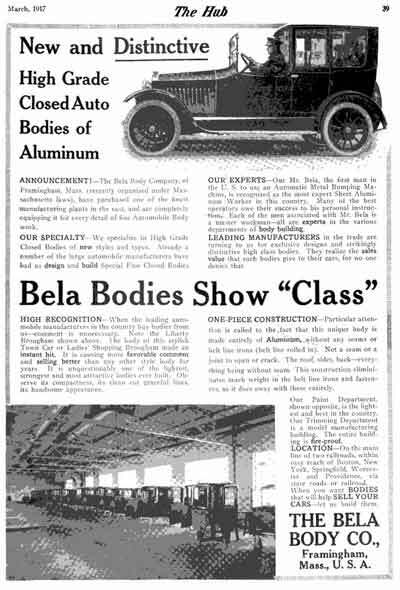 In 1919 Long closed down the Amesbury body plant and moved all body-building operations into Bela's Framingham buildings where he commenced the manufacture of entire sedan bodies for Franklin. "FRAMINGHAM, Dec 1—A disagreement arising between employees of the Bela Body Company, manufacturers of automobile bodies, and the company over a weekly schedule, the men, including metal workers, painters and upholsterers, left their benches today. The men in the Clark St. works were the first to go out. They were followed later in the day by the employees in the Fountain St. factory. "The men had been on a five-day week schedule of 45 hours since early in the Summer. It being stated at the time the rule went into effect by the R. H. Long interests, which operate the Bela Body Company plants, that the plan would be tried out for a few months, probably until October. There was an extension until November, however. "The company last week informed its employees that owing to the large number of orders the factories would be operated on a 48-hour week schedule to increase production, the operatives to be granted an increase in wages for the three extra hours, as well as time and a half for all over 48 hours. "It is understood the operatives insisted on time and a half for all above 45 hours, hence the disagreement. It is further said that the operatives are displeased over the discharge of some of their fellow workmen. "Last week machinists of the R. H. Long Machinery Company, who were also enjoying the 45-hour weekly schedule, won’t out on strike when requested to work three additional hours. Their demand was similar to that made by the Bela Body workers, time and a half for the three hours, to which the company would not agree. "It was reported that many of the striking machinists resumed work, accepting the company's offer. It was said that others had also made application for their old jobs." Although Long was a well-known businessman, his political career remains his lasting legacy. Long first ran for public office in 1912 as the unsuccessful Democratic candidate for Lieutenant Governor. A wealthy man, he reasoned that if he owned a newspaper, his chances of winning an election might increase so soon afterwards he purchased a controlling interest in the Boston Telegram. Tales of successful "boy cobblers" within its pages helped him garner the Democratic nomination for Governor of Massachusetts in the 1918 and 1919 elections. "Long Wins Over Gaston by 2700, Barry Is Third. "Richard H. Long of Framingham was nominated as the Democratic candidate for Governor of Massachusetts in the primary election yesterday. His plurality over Col William A. Gaston, who ran second, was about 2700. Ex-Lieut. Gov. Edward P. Barry was about 4500 votes behind Col Gaston. "The vote for Governor on the Democratic ticket, with 11 towns and Quincy, Everett and New Bedford missing, but with their votes estimated on the basis of the rest of the State and of previous votes in those places, was: Long, 23,454; Gaston, 20,761; Barry, 10,335.
apparent plurality was gradually wiped out ; the other cities went, for the most part, for Mr. Long: and he quickly went from third to first place. He carried Worcester by about 1000, Lynn by 800, Holyoke by 775, Springfield by 700, Fall River by 400, Marlboro by 275, Lawrence by 200, Fitchburg by 150 and Lowell and Chicopee by about 100 each. "The towns, especially those in the middle and western parts of the State, also went for Mr. Long, and his nomination was soon made certain. The result was a surprise except to Mr. Long and his closest supporters, who have maintained from the beginning that he would be nominated. "The vote of Boston for Governor was: Gaston, 12,111; Barry, 9854; Long, 8326. Barry carried Wards 9, 10 find 11 his own section of the city, but every other Boston ward went for Gaston. Ward 5, the home of Martin Lomasney, gave Gaston 1313 votes, Barry 640, and Long 125." "And Calvin Coolidge is elected"
Due to his narrow defeat in 1918, Long was easily nominated to represent the Democratic party in the November 4, 1919 election. "Richard H. Long of Framingham yesterday filed papers as candidate for the Democratic nomination for Governor with the Secretary of State. Mr. Long was the candidate of his party last year. His papers, as filed yesterday, contained 1222 signatures, 203 from Hampden County, 266 from Essex. 340 from Middlesex and 353 from Worcester." Long faced the same opponent as in 1918, Calvin Coolidge, but this time the incumbent Governor Coolidge defeated him in a landslide victory. The main reason for the defeat was due to the public's approval of how he (Coolidge) handled the bloody 1919 Boston Police strike where 80% of the city's policemen went on strike after the police commissioner refused to allow them to unionize. "Replying to your telegram, I have already refused to remove the Police Commissioner of Boston. I did not appoint him. He can assume no position which the courts would uphold except what the people have by the authority of their law vested in him. He speaks only with their voice. The right of the police of Boston to affiliate has always been questioned, never granted, is now prohibited. The suggestion of President Wilson to Washington does not apply to Boston. There the police have remained on duty. Here the Policemen's Union left their duty, an action which President Wilson characterized as a crime against civilization. Your assertion that the Commissioner was wrong cannot justify the wrong of leaving the city unguarded. That furnished the opportunity, the criminal element furnished the action. There is no right to strike against the public safety by anybody, anywhere, any time. You ask that the public safety again be placed in the hands of these same policemen while they continue in disobedience to the laws of Massachusetts and in their refusal to obey the orders of the Police Department. Nineteen men have been tried and removed. Others having abandoned their duty, their places have, under the law, been declared vacant on the opinion of the Attorney General. I can suggest no authority outside the courts to take further action. I wish to join and assist in taking a broad view of every situation. A grave responsibility rests on all of us. You can depend on me to support you in every legal action and sound policy. I am equally determined to defend the sovereignty of Massachusetts and to maintain the authority and jurisdiction over her public officers where it has been placed by the Constitution and law of her people. By Election Day it would have taken a miracle to defeat the immensely-popular Governor and Long was soundly defeated by 125,101 votes - 317,774 to 192,673 - more than seven times Coolidge's margin of victory in the previous election. "WORCESTER. April 1— Negotiations for the purchase of a large tract of land in the North End of Worcester as the site for a $1,000,000 plant to manufacture automobile bodies were practically completed today and it is expected, the papers will be passed tomorrow. "It is reported that the plant will give employment to 4,500 hands and homes for many of them are to be erected on land surrounding the shop. "Richard H Long of Framingham is said to be at the head of the concern. The deal for the purchase of the land has been made by Worcester men." "R.H. Long begins erection of new factory in Worcester, Mass." "Worcester, Mass., March 28. – Richard H. Long of Framingham, has announced plans for building a large factory here for the manufacture of automobile bodies. Operation will begin early next Fall with a force of 2,000 men and, ultimately, expects to employ about 10,000." "Worcester, Mass.—Richard H. Long of Framingham started the erection of a five-story building, which will accommodate 10,000 employees and will be devoted to manufacture of automobile bodies." "TEMPLE-WESTCOTT — Framingham, Massachusetts — (1921-1922) — Temple-Westcott is a conundrum. Apparently the car, which was a six, was built in the shops of the Bela Body Company in Framingham. A total production of both ten and twenty Temple-Westcotts has been reported, but for whom were the cars built? That remains a mystery. 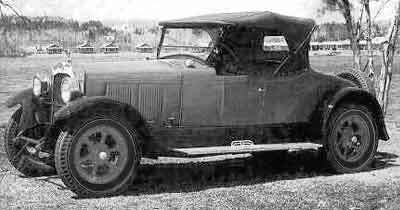 The possibility that the vehicles were produced on special order for a Temple Westcott dealership in the area seemed likely, but alas there were no dealerships during the early Twenties in Boston, Framingham or Amesbury that carried the name of either Temple or Westcott. And there was no relationship between this car and the Westcott then being built in Ohio. When the Bela Body Co. subsequently moved to Amesbury, the Bela plant in which the Temple-Westcotts had been built was acquired by the Dennison Company." Kimes & Clark have the Bela Body chronology backwards, but I can add that I also could not locate any additional information on the Temple-Wescott, nor its incorporators or distributors. However, the Jackmann-Jameson Co., 910 Commonwealth Ave., Boston (coincidentally the former Hume Carriage Co. building) were listed as the New England distributors of the Ohio-built Westcott and may somehow be connected. 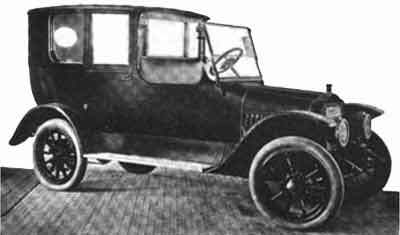 To keep himself busy after his wife was killed in an aircraft accident in 1920, Richard H. Long decided to start making automobiles. In an address made on March 10, 1922, Long stated that planning for the Bay State commenced one year previous, March 10, 1921. "Leaving Winton I went to the R. H. Long Co. of Framingham, Mass. They owned the Bela Body Company which had been building complete bodies for the Franklin Co... Mr. Long thereupon decided to build a car of his own. I was hired to do the job. The car was called the Bay State. Several hundred of these were built. Upon completion of this design, I went to the Velie Motor Car Co. at Moline, ill., as Chief Engineer in January 1924." Snow is remembered today for his work as Auburn's chief engineer where he worked on such legendary vehicles as the Cord L-29, Auburn Speedster, and Cord 810/812. Even before one sketch was drawn Long had a name for his car, Bay State. It was made in Massachusetts, the Bay State, and it was going to be sold only in Massachusetts. 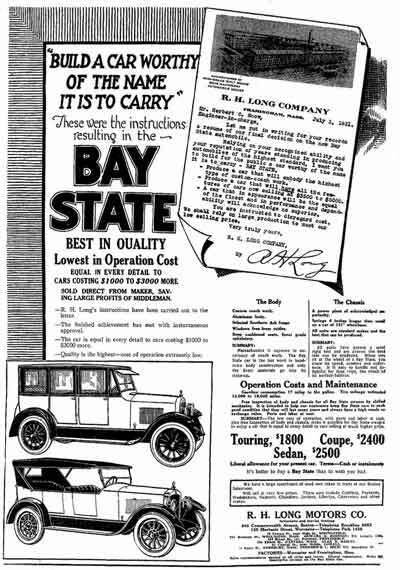 Long formed a new firm, the Bay State Automobile Co. and slowly began production of the Bay State automobile in the former Bela Body plant that he had acquired in August of 1918. In 1920 Long acquired the services of Fredrick Howe Clark as chief engineer of his various manufacturing facilities. Clark moved to Worcester in 1921 to oversee construction of the firm's new (67) Millbrook Street factory. "The Bay State motor car made its first appearance here Friday, when a number of friends of Richard H. Long, the Framingham shoe manufacturer who is building it, were invited to inspect and ride in it from the Courthouse. It is a sedan, and Mr. Long proposes to sell it at a low figure. He is going to cater first to the New England trade and later increase production and sell elsewhere. His plans now call for the delivering the car free at any point in New England, driving it over the road to customers. "The new car is attractive, substantially built and rides easily. It has a six-cylinder Red Seal Continental motor, 3 ¼ x 4 ½, with Delco ignition and a wheelbase of 121 inches. Equipment is complete. The body was built in Mr. Long's factory at Framingham. He is just finishing another plant at Worcester, 600 feet long by 75 wide, of six stories. The first unit of several such structures where he proposes to turn out a number of cars. "For the present the cars will be sedans and touring models. Later on other models will be added to the line. He has equipment for making his own parts in the near future. The first cars will be ready for delivery this Fall. He has secured Mr. Snow of Cleveland, formerly with Winton, to work with his own engineering department. "Richard F. Long, the oldest son, also has charge of the automobile body plant, where bodies for other cars have been turned out for some time, will be active in the management of the motor car production." "BOSTON, Aug. 22—The Bay State motor car has made its first appearance on the streets of Boston. A number of friends of Richard H. Long the Framingham shoe manufacturer, were invited to inspect and ride in it from the courthouse. It is a sedan and Long proposes to sell it for $2,500. He is going to cater first to the New England trade, and later increase production and sell elsewhere. His plans now call for delivering the car free at any point in New England, driving it over the road to the customers. "The new car has a six cylinder Red Seal Continental motor 3 ¼ x 4 ½ with Delco ignition and a wheelbase of 121 inches. 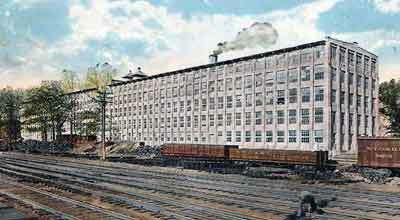 The body was built in Long's factory at Framingham. He is just finishing another plant at Worcester 600 feet long by 75 feet wide of six stories, the first unit of several such structures where he proposes to turn out a number of cars. For the present the cars will be sedans and touring models. Later on other models will be added to the line. He has equipment for making his own parts in the near future. The first cars will be ready for delivery this fall. An engineer has been obtained." The Bay State was revealed to the nation on the mezzanine of the Hotel Commodore in during the January 1922 New York Automobile Show. 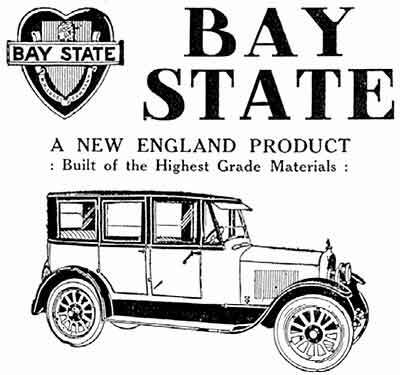 The Long-built aluminum-skinned sedan body of the Bay State was a masterpiece and featured "Nineteen coats of filler, varnish and paint" according to sales literature. Built on two wheelbases, 121" and 128", The Bay State's initial offerings included a touring, roadster coupe and sedan priced from $1,800-$2,500. Soon afterwards new body styles were added which included a brougham, phaeton, sport sedan, sport touring, and a seven-passenger sedan, which was offered at $2,750. 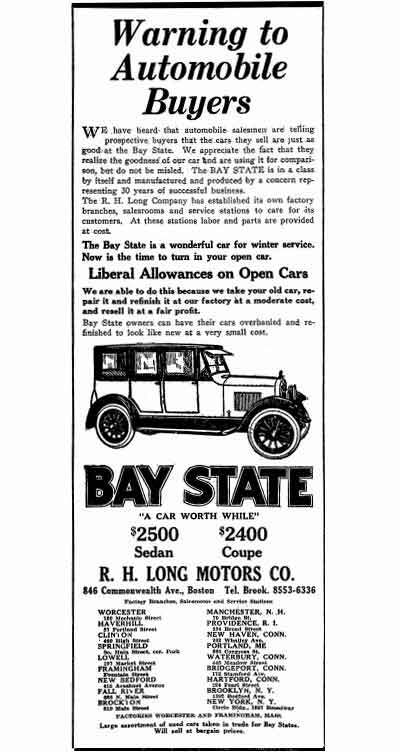 "Newspaper advertising is being used by the R.H. Long Company, Framingham and Worcester, Mass., to advertise the Bay State Pleasure Car. The advertising is handled by Chambers & Wiswell, Inc., Boston advertising agency. The car is manufactured by the same interests that control the R.H. Long Shoe Company." 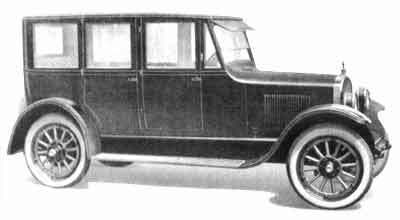 During 1922 coach-building activities for third-party firms (Franklin, Hudson, Temple-Wescott, and others) continued alongside production of the Bay State but increased sales of the Long-built automobile soon found the firm short on space forcing Long to temporarily purchase coachwork from another New England coachbuilder, the Woonsocket Mfg Co. of Woonsocket and Providence, Rhode Island. "Automobile dealers throughout the country are watching with interest the strides made by Richard H. Long of Framingham in the manufacture of automobiles. Mr. Long, previous to the War, was engaged exclusively in the manufacture of shoes. He is now producing the Bay State car, an automobile of high quality in every detail of material and workmanship. "During the World War the R.H. Long Company's corps of skilled engineers and mechanics produced for the Nation a great variety of goods, many of which had never before been manufactured in this section of the country. "Among these productions was the manufacture of high-grade automobile bodies. "After completion of war-time activities a rigid, intelligent investigation resulted in Mr. Long's determination to manufacture a car having appearances and performance of exclusive, high-priced cars, but selling within the reach of the great middle class. "The same efficient war-time organization with an additional number of the company's best automobile experts, were retained to manufacture the Bay State car. "Mr. Long has been actively engaged m the manufacture of automobiles for about one year. Far-extending research work has been conducted and severe experiments have been made over a much longer period. The untiring efforts on the part of his organization have been rewarded by the Bay State car. "The leading feature of the Bay State automobile is the even balance of the car. That is the reason that it runs smoothly and uses such a small amount of gasoline and is so easy on tires. The Bay State car is expected by many automobile experts to make many friends in the great middle class." "R. H. LONG MOTORS CO.
"FACTORIES WORCESTER AND FRAMINGHAM, MASS. Long Motors Co. 846 Commonwealth, Boston, Mass." In early 1923 Long's contract with Franklin expired and along with it the firm's production body building business. For a short time sales of the Bay State expanded to regions outside of Massachusetts with distributors as far away as Chicago. "The R.H. Long Motors Co., Framingham, Mass., has been incorporated under State laws with capital of $1,500,000 to take over and operate the plants of the R.H. Long Co. at Framingham and Worcester, specializing in the production of a six-cylinder car. "Arrangements been perfected for the establishment of a factory branch at 252 Central Avenue, Newark, NJ. Richard H. Long is president and treasurer." "3 Creditors Petition Long Bankruptcy: Charge Preferential Payments Were Made Where Company Was Insolvent. "Boston, Dec 3 – An involuntary petition in bankruptcy has been filed in the United State District court against the R.H. Long Co. The petitioners are three creditors with small claims, who charge preferential payments last November, when, they allege, the company was insolvent. "Boston, Dec. 1 – Following a meeting held at one of the larger banking houses here a few days ago, plans were made for handling the affairs of the R.H. Long Motors Co., the R.H. Long Co. and the R.H. Long Shoe Co., all of Framingham, through two committees. "One is composed of Wilbur W. Higgins of the Old Colony Trust Co., George E Pierce of the National Shawmut Bank, both of Boston, and John W Bargefrede of the First National Bank, Brooklyn, N.Y. to act for the secured creditors. The other is made up of G.L. Margeson, B.F. Goodrich Co.; TM Regan, the American Credit Indemnity Co. of Boston, and one other to be selected later to look after the unsecured creditors. The appointment of these committees is the aftermath of meetings held during the last few days by Robert M. Falkenau of the Irving Bank-Columbia Trust Co., Brooklyn, NY, and WW Shepard of the Worcester Bank & Trust Co. and Higgins. "The business has been turned over to the Caswell & Woods Associates, industrial engineers, as a result of "lack of liquid working capital and a consequent inability on the part of the companies to meet their current liabilities." According to the report of the committee of investigation, Chaswell & Woods estimates the assets of the three companies at about $1,875,000 and the direct liabilities as about $1,200,000 and their contingent liabilities at approximately $800,000." "The principal business of the Longs companies is the building of automobiles known as the Bay State. This work was undertaken several years ago when the R.H. Long Co. had completed its Government work. Long previously had done some body building for automobile making concerns. He sent to Cleveland and secured a designer formerly with Winton, and the Bay State was placed on the market, its closed models — the first produced — selling at $2500. Salesrooms were opened in Boston and other cities, and a plant was secured at Worcester in addition to the one at Framingham. Long has not operated the shoe plant since Sept. 1, last. "He and his family practically control the shares of stock of all three companies. The creditors committee is optimistic over the possibilities of straightening out the difficulties. In its report it says: The R.H. Long Co. is the parent company. Substantially all the stock is owned by Richard H. Long and members of the Long family. 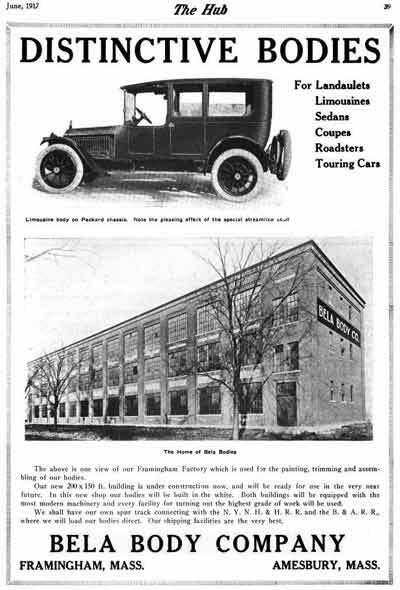 The R.H. Long Motors Co. owns the principal manufacturing plant at Framingham, the Worcester factory erected last year, the inventory of the finished Bay State automobiles and materials for their manufacture, and the equipment contained in the plant at Framingham. "The R.H. Long Shoe Co. owns the inventory, machinery and accounts appertaining to the manufacture of shoes. The R.H. Long Co. owns the stock of the two subsidiary companies, a considerable amount of land in Framingham, upon which are located a large wooden shoe factory, several brick buildings for the manufacture of shoe machinery and certain dwelling houses and farm buildings, together with inventory which includes ware materials believed to have substantial value. "It did own a large tract of land adjacent to the new factory building in Worcester. This land has been transferred to R H. Long as trustee for the RH Long Company. The principal business of the companies today is the manufacture of automobiles. The RH Long Motors Co. does the manufacturing and the RH Long Co. the selling. The RH Long Shoe Co. has not been operated since Sept. 1, 1923. Its inventory has been substantially liquidated. "The assets and liabilities figures listed by the Bureau of Internal Revenue suggest an additional tax liability of possibly $1,400,000. Mr. Long, however, expresses the belief that additional taxes, if any, will be very small. The tax situation, however, calls for immediate and careful study. "They have also advised your committee that in their opinion the appointment of a receiver at the present time would jeopardize the chances of satisfactorily disposing of the tax situation." "BOSTON, Dec. 6 (By Associated Press)—The R.H. Long Motors Co, with factories in Framingham and Worcester, was petitioned into bankruptcy in the federal district court today, "
"The petitioning creditors, who allege preferential payment to other creditors, are the Federal National Bank of Boston, with a claim of $27,600 on a promissory note: Bay State National bank, Lawrence, $12,000 on notes; Manufacturers National bank, Lewiston, Me., $12,000 on a note, and Chambers & Wiswell, Boston, $2,908 for advertising. "A petition in bankruptcy recently was filed against the R. H. Long Co., parent company of the R.H. Long Motors Co. and the R.H. Long Shoe Co., after a creditors' committee had reported that the concern was embarrassed by lack of liquid assets. 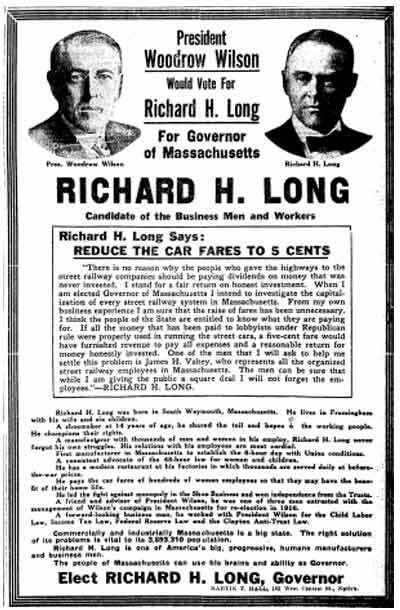 Richard H. Long of Framingham, former Democratic candidate for governor, heads the R. H. Long Co. In the months immediately preceding the bankruptcy announcement the Long organization sought out tenants for its idle factories. The Luxor Cab Manufacturing Corp., a Manhattan-based cab distributor owned by Allie S. Freed began building taxicabs in one of the former Bay State plants under the watchful eye of Morris Heit, Luxor's manufacturing supervisor. Coincidentally, Luxor had recently begun manufacturing taxicabs in the Hagerstown, Maryland plant of the Moller Motor Car Co., the manufacturer of the Crawford Automobile. 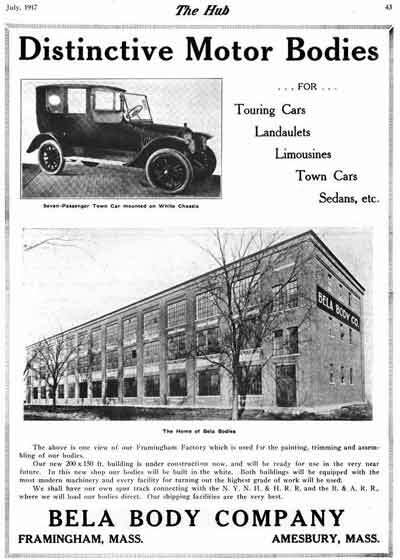 Unlike the R. H. Long enterprise, Moller was well-financed, built their own high-quality coachwork, and was conveniently located near Freed’s current and potential customers. "Luxor Taxicabs Being Made On Third Floor Of Building. "The Moller Motor Car Co., which recently purchased the old Crawford Bicycle Works, later the Maryland Pressed Steel Co. and the Poole Engineering Co., has moved the Luxor taxicab factory to the third floor which will be the permanent place for the manufacture of these taxicabs. The Moller Motor Car Co. is also making its line of goods in other parts of the building. This plant is destined to be one of the busy factories in Hagerstown." Freed had his own design and management team that not only designed the vehicles but also oversaw their production. A skilled delineator named Wehrle did all the design and engineering work while Heit took care of the manufacturing end. The pair made regular trips between Framingham, New York City and Hagerstown, and occupied their own offices in all three cities. Like the Crawford, the Luxor was an assembled vehicle, and was built using a heavy-duty 114-inch wheelbase chassis equipped with Budd disc wheels, Brown-Lipe transmission and a 4-cylinder Buda light truck engine. The Luxor’s heavy-duty fenders were stamped out of sturdy sheet steel and its Moller-built limousine and landaulet taxicab bodies were painted cream and light blue with red striped black moldings. The same spherical illuminated radiator caps found on the Dagmar were employed as were bi-lateral colored carriage lamps housed under a nickel-plated lion’s head. The leather-upholstered interiors were of a quality not normally seen in a taxi and the sturdily built taxicabs had a suggest list price of close to $3,000. When given a choice, the typical cab customer would choose to ride in a Luxor over any of its competitors. "FRAMINGHAM, MASS., May 14— Guy Murchie, receiver for the R.H. Long Co., maker of the Bay State car, has been given authority by Judge Morton of the Federal court to sell the main factory of the company here to the Luxor Cab Manufacturing Corp. of Hagerstown, Md. The price is to be $250,000. The Luxor company plans to build cabs in the plant. And open sales rooms in Boston shortly for the sale of its cabs." During much of 1924 Luxor cabs were manufactured on the production line formerly used to produce the Bay State. Luxor also utilized unused Bay State components for their taxicabs, and close examination of the two vehicles reveals that the Luxor and Bay State shared the same chassis, drivetrain and coachwork, most of which was supplied by the Woonsocket Mfg Co.
"Boston Mass., August 18th, 1924 – The Bay State Car is to be continued in production contingent upon court approval, under a plan worked out by the creditors of all the R.H. Long companies. It was voted to form a corporation to take control of the affairs of the companies and under the plan of a three years extension of credit operated them, paying off one-third of the indebtedness each year. "The creditors will have control but working with them will be R.H. Long, and some of the other identified with the company. This plan will be placed before the court that appointed a receiver some time ago under which the companies were being operated. Guy D. Murchie, receiver, will make his report and then the plan will be acted upon favorably because the creditors see in this move a chance to prevent the R.H. Long companies from going into bankruptcy. Meanwhile the Luxor Cab Company has taken over part of one of the R.H. Long factories for building taxicabs." Even though they were built in two different cities, the Framingham- and Hagerstown-built Luxors shared the same parts and were nearly identical in appearance save for slight variations in the coachwork. 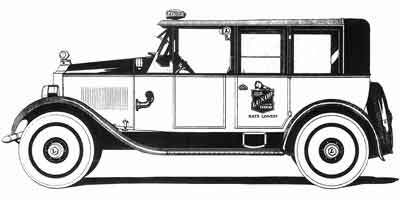 In late 1924 Luxor sued another Manhattan cab operator, the Leading Cab Co., for appropriating the cream and light blue paint scheme of the firm’s taxicabs. New York State Supreme Court justice Levy ruled in favor of Luxor and granted them an injunction forbidding Leading Cab et al. from using the Luxor colors. "The taxicab industry and even some lawyers who should know better. They seemed to have been of the opinion that a taxicab manufacturer could acquire no property right on a color combination and that everyone was free to appropriate a competitor's good will. This mistaken idea was due to a misreading of the Yellow Cab cases." "Taxicab Transportation has graduated from the converted pleasure car and "rattle-trap" stage. Now it is a highly specialized business. Experience proves conclusively that the operation of Taxicabs can be made profitable, providing equipment of the very highest order is used. "This equipment must be supplemented by a service that is both economical and efficient in addition to being courteous. The careful buyer of Taxicab equipment will find that the selection of LUXOR; The Better Taxicab is the most logical. The construction of LUXOR and the units built into it are of the highest order, assuring long life and freedom from mechanical trouble. "And for the riding public. LUXOR is the most logical selection. Its rich and dignified appearance, set off by a careful driver in his made-to-fit uniform will incite and satisfy that desire to ride in Luxury and Comfort. "One glance will tell you why. LUXOR receives preference over any other taxicab, especially as the cost is no higher. "The riding public welcomes LUXOR and gives it their enthusiastic support. Ownership and Operation of the Better Taxicab proves that it is an investment of the highest order, and one that will bring large profits and priceless good-will. Production is being rapidly sold up, we strongly recommend immediate action in the purchase of The Better Taxicab." "The Luxor Cab Manufacturing Co. Framingham, Mass., builder of the Luxor taxicabs, expects to begin production soon of a 6-cylinder car to be known as the "Standish." The open models will list at about $2100 and the sedan at $2595. The company occupies the former Long plant in which the Bay State cars were produced." 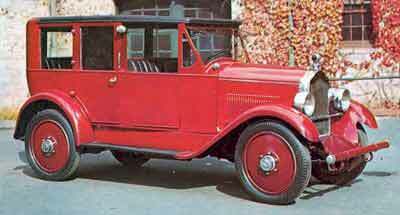 A single prototype (possibly two) was produced and, not surprisingly, eyewitnesses claimed the car looked like a Dagmar with wire wheels and a Mercedes-style grill. No production Standish’s were forthcoming and after being used by Freed as a daily driver, the prototype disappeared. "Bay State Plant Sold; Production to Continue. 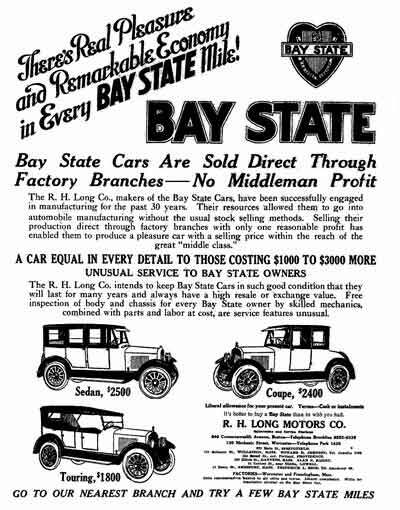 "FRAMINGHAM, MASS., Oct. 1 (1924) — The Bay State Motor Co. has purchased all the merchandise, machinery, cars, goodwill and other property of the Bay State Automobile Co. from Guy H. Murchie, the receiver. As a result, the factories where the Bay State cars were being turned out for the past few years will resume operations this month when about 500 employees, who have been out of work for a long time, will be reemployed. "The new corporation will operate under the direction of Richard H. Long, who founded the company. No report has been issued as to the price paid to Mr. Murchie, but the plant alone is valued at more than $600,000. "The Long Motor Sales Co. is to have charge of the sales of the output." At that time Long had recently purchased an interest in the Jephson, Scott Body Co., a small East Orange, New Jersey coachbuilder that produced production bodies for Crane-Simplex. 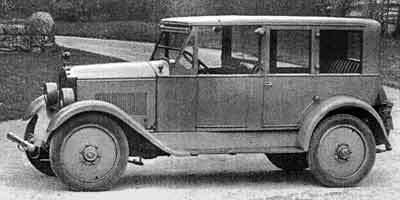 Although the Crane-Simplex was a magnificent car, the chassis was little-changed from its pre-War ancestor and proved to be a financial disaster. Production was halted during 1923 and the directors of Jephson, Scott sought additional investors to keep the plant going. 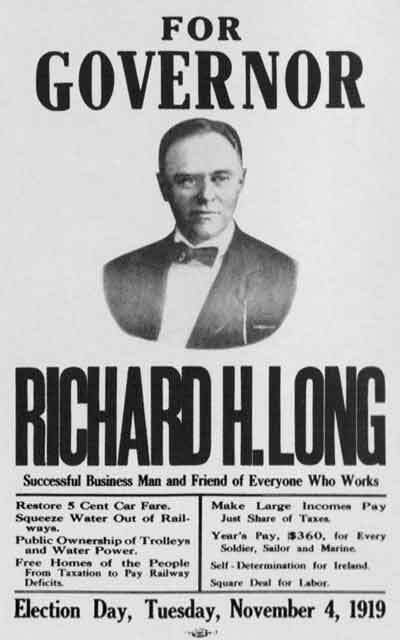 An interested party was located in the form of Richard H. Long, the manufacturer of the Bay State automobile, and owner of the now defunct Bela Body Co.
At the time one of Long's numerous auto-related businesses, the R.H. Long Motors Co., was headquartered in Newark at 252 Central Avenue, less than a mile away from the Jephson-Scott body works. He saw his investment in the firm as an economical way to get back into the auto body building business and hoped to use the firm's coachwork on the Bay State if and when production resumed back in Framingham. Although J.M. Quinby & Co. - the predecessors of Jephson, Scott - had withdrawn from business in 1915, the firm's principle owners, William and Henry Ogden, elected to hold onto the name when they auctioned off what remained of the firm's assets in 1917. Ernest Kay, Quinby's former treasurer, negotiated a deal with the Ogdens whereby he and Richard H. Long would license the name for their new business. In April 1923 the pair reorganized Jephson-Scott as the J.M. Quinby & Co. To finance the new enterprise, the pair formed the Long, Kay & Company, a brokerage house whose sole business was the sales of shares in the “new” J.M Quinby & Co. Inc. for which they raised $200,000 through a sale of preferred stock. Although it would be illegal today, the pair pocketed $40 for every $85 they placed in the Quinby coffers, a practice that was common in the years before the strict regulations that were made necessary by the stock market crash of ’29. The reorganized J.M. Quinby & Co. Inc. prospered for a short period, but within the year its business took a turn for the worse and Long took over as president to protect his investment. He reduced the workforce and by the end of 1925 its outlook had greatly improved. By that time the Bay State had been out of production for almost two years, however Long found a booming business in the commercial body field, in particular building bus bodies for New Jersey's public transit system. Unfortunately the firm’s output never exceeded 25% of capacity and dividends were never paid out to its shareholders, so in 1926 they took Long and Kay to court over the matter. "Proceeding by Thomas Schroeck and others against J.M. Quinby & Co., formerly known as the Jephson, Scott Body Company, Inc., and another, for mandamus." The judge found that no wrongdoing had been committed and rejected the shareholders’ petition. The firm lasted for a couple more years but didn’t survive the decade, going out of business for good in 1929. "BOSTON. Aug. 20— (AP) Counsel for the R.H. Long company, the R.H. Long Shoe company and the R.H. Long Motors company, all of Framingham, which were petitioned into bankruptcy more than two years ago, today filed with Referee Robert K. Goodwin a schedule calling for 100 per cent payment to creditors. As a part of the plan the R.H. Long operating company would issue three-year promissory notes in part payment to creditors. The plan will be submitted to the United States court here on Monday." Most likely the news article was related to his bid to obtain a franchise from the Cadillac Motor Company, which ultimately succeeded in 1927 when the R.H. Long Motor Sales Co. opened a Cadillac dealership in Framingham. Strong sales resulted in the procurement of a GMC franchise in 1929 and a Pontiac distributorship in 1931. Although he never again ran for public office, Long remained active in the state's Democratic Party serving as a Delegate to the Democratic National Convention in 1928. Surprisingly the Long Auto Group, a direct descendant of R.H. Long Motor Sales Co., remains in business today, enjoying the enviable position of being one of New England's largest GM dealership groups. Its founder, Richard H. Long, remained at his desk into his early eighties, passing away at the age of 91 on April 16, 1957. Long's Worcester plant (67 Millbrook St. ) remains standing in North Worcester just West of where Interstate 190 merges with Interstate 290. Popularly known as the old Thom McAn building, the five story, 270,000 square ft. concrete and steel structure was purchased for $3.3 million by Worcester Millbrook LLC in 1999 and renamed the Worcester Business Center. "We're proud to own this Worcester landmark property," said John Boynton, Worcester Millbrook's managing partner at the time of the sale. 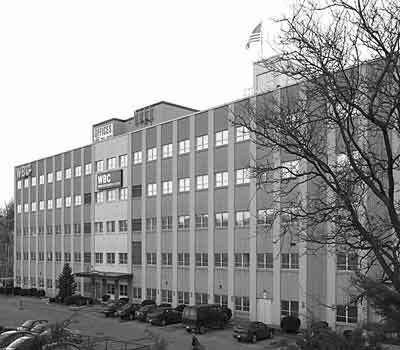 "It has played an important role in Worcester's business history from its early days as a manufacturing facility for the Bay State automobile, and through thirty years as the headquarters of Thom McAn Shoes. We hope to return it to prominence once again as the Worcester Business Center." In 2007 the building was sold for $10.4 million to a Boston-based investment group, Worcester Business Center LLC. Original sources of information are given when available. Additional pictures, information and corrections are most welcome.